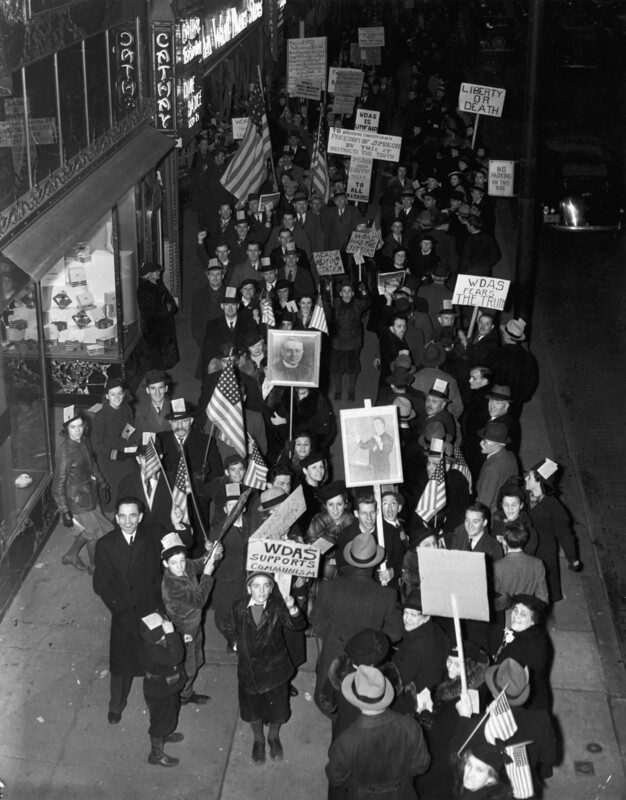 Pickets protesting WDAS for its refusal to broadcast speeches by Father Charles Coughlin, Philadelphia, PA, circa 1939. In the late 1930s neo-Fascist and anti-Semitic groups staged angry demonstrations in Philadelphia. After WDAS suspended the broadcast of speeches by Father Charles Coughlin in November 1938 because of their anti-Semitic content, thousands of protestors picketed the station's studio at 1209-22 Chestnut Street and held mass protest meetings around the city. In the months that followed Coughlin supporters attacked Jewish businesses, disrupted political meetings, and assaulted others they feared were betraying "Christianity and Americanism."